Hey, I just had a thought, why don't they make coffee flavored Oreos? I cant be the only one who thinks the gritty Oreos would meld well with the earthy nature of coffee... Oh wait, they came out with Double Delight Oreos which had two flavors in each Oreo. One of them was Coffee & Cream! Weird! Ok, anyway. 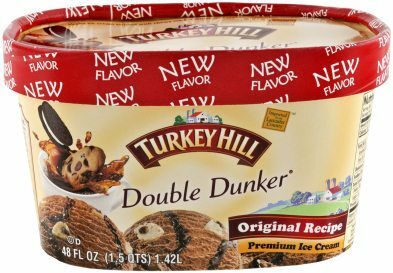 So here is Turkey Hill Double Dunker ice cream and it was a tough sell because the base is mocha ice cream (and you know how I feel about coffee and mocha). However, it's got that awesome Turkey Hill Cookie Swirl I love, plus it's got cookie dough bits, so I felt obligated to try it. Unfortunately, the first taste test went as expected. I didn't like it and these pictures are in fact from... a month and a half ago. Let me put a side note here because a flavor like this can gum up the works. You figure you won't like it but you buy it anyway, then you don't like it, but then you don't want to waste it, so it just sits there clogging the review pipe. Well, no more! Here's the container when it was first uncovered. I had hoped for more swirl on my first glance, but there are a good number of cookie dough bits. Now my problem was that there wasn't enough swirl on the first scooping to get past the mocha base. I am currently now nursing my second scoop and the secret with this bowl is that I dug straight down into that cookie swirl you see on the far right. My bowl looks like it's about 50% swirl and when spooned properly I do get enough cookie swirl to get a decent flavor (for my non-coffee lovin' tastebuds that is). 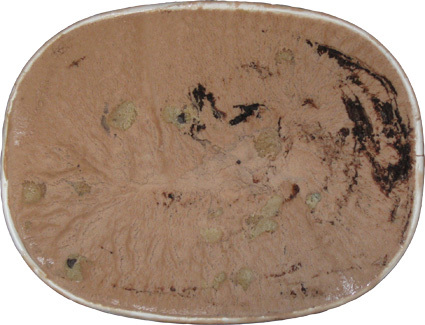 The mocha is still there, but it's more there to add to the gritty and earthy nature of the whole thing. Oh, and as for the cookie dough bits, they are a nice big size and they add some nice texture here and there, but you can't actually taste them over the mocha. So while I still don't love it (or the coffee aftertaste), and you can be sure I won't buy it again, it's still a respectable ice cream. I guess my point is: why can't we get this awesome swirl somewhere else? 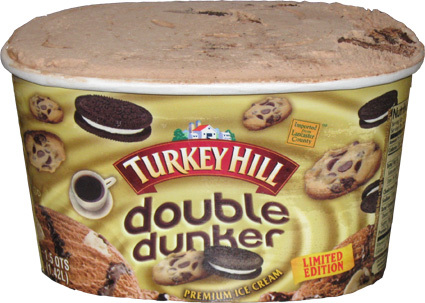 (well, besides in Turkey Hill's Extreme Cookies N' Cream) Ok, I'm off to go rinse the coffee aftertaste out of my mouth. On Second Scoop: Well I've had two more swirl filled bowls (covered in nesquik), but the swirl is all gone now so I am moving on. Maybe my friend the swirl can come back in a nice (not sure which) flavor mixed with mini M&Ms, or maybe even Reese Pieces, something crazy like that. 2012 Update: While this flavor was originally limited edition, it did well enough that they made it a permanent flavor. You can see the listing for it here. Oh my goodness.. this was the best flavor I"ve ever had of TH ice cream!!! Please don't limit the edition.. keep it around.. So yum.. I thought perfect balance of all flavors. I'm a coffee lover but I tasted more chocolate than mocha. There I was in the ice cream aisle of my local bottom dollar store when this caught my eyes. I just stared for a few seconds.. then read the wonderful description.. all of the things added together to make to most delectable dessert experience.. YUM! This is probably my favorite flavor right now, it has a great mix of flavors and textures and goes down easy. Wow!! Can't find it at every store but it's not too hard to track down. Thank you TH!! So, I finally tried this flavor, and I kinda like it, but I see your point about the base overpowering the cookie dough flavor (on top of that, my container was stingy with the cookie dough to begin with) They should've gone with dark brown sugar maybe. I think you're being a bit harsh on the base though, and kind of wonder if some of the "coffee aftertaste" is kind of a psychological thing. Meaning that, you KNEW there was coffee involved and you hate coffee, so you went in hating it. I don't mean that as an insult to you. I also hate coffee, and lattes and wouldn't have bought this if it had no mixins. But coffee is only the 16th ingredient on the container. What I tasted was chocolate whipped cream, not coffee. I will agree with you that I wasn't crazy about the base, but the swirl and the dough chunks make it too good. Nope, not psychological, i'm just overly sensitive to bitter and I know try to add that disclaimer to any related reviews that come across my path (also why I usually let Nick do the coffee reviews). secondary disclaimer: this may have changed somewhat in the 7 years since I reviewed it.